I arrived into Hong Kong at 6:30 a.m. It had been a 4 hour flight from Delhi, departing at 11 PM, and somehow, I had managed to sleep pretty much the entire flight. So, with that 4 hours of sleep under my belt, I proceeded through Hong Kong Immigration and found myself in the midst of the stratosphere that is the Hong Kong airport; big, bright and immaculate, the first major contrast from where I had come. 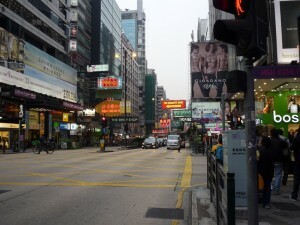 I grabbed a cab to downtown Kowloon – Tsim Sha Tsui (about 30 bucks) and proceeded to my “Guest House” accommodations. It was the Ashoka Guest House, one that I had found online, and a deal at 30 bucks per night, since there was nothing else for less than 200. Rugby was infiltrating the city for the weekend – Hong Kong 7’s and everything was either full or expensive. As I made my way up the Chung King Mansion’s elevator, each floor presented a new ‘guest house’ option and my stomach begin to turn slightly at the rankness of it all. Exiting the elevator on the 7th floor, I found the narrow doorway that displayed the slightly bent and hanging, “Ashoka Guest House”. By now, it was 8:30 a.m. and I knocked on the door. The front desk clerk sleepily answered the door – he was sleeping on the floor behind the front desk – and showed me the way to the common area where I could wait. As I entered the area, in the dark, someone stirred from the couch, then rolled over and got up, mumbling good morning as they quickly exited. I sat down, somewhat exhausted yet unsure of what to do next so I logged onto the WiFi network and attempted to pass some time since the front desk sleeper had told me that a room would not be ready until 11. I closed my netbook and paid attention to the ‘ick’ factor that I was feeling, asking if ‘they’ would watch me luggage for a bit as I went to find a coffee. I didn’t feel great leaving my gear but had little options at this point. As I wandered out onto the street and felt the city beginning to wake up, it was hard to not equate this area of town with New York’s Time Square. Neon signs and camera shops were everywhere and I thought that this was going to be a fun couple of days here. Like the true Cancer the Crab that I am, I began walking toward the water. The waterfront was alive and beautiful. I continued walking around it, and literally bumped into the YMCA. I walked through the doors, and again the light resounding through the architecture was beautiful and I thought, ‘wow, I have to stay here.’ I approached the front desk and told them my story and they told me that they had rooms available. I quickly made my way back to the Ashoka Guest House and informed them that I would not be staying there, that instead I was staying down the street with a friend. Begrudgingly, they allowed me to cancel my reservation with no charge and away I went, backpack, front pack, courier bag, purse and rolling suitcase in tow. It was a brilliant move and a brilliant decision! AND it was all mine! I checked in at the Y. The rooms were immaculate and bright and because I had shown my Y card, I received a 10% discount so my room was around 130 bucks per night. Money well spent I thought. I felt safe and happy and there is a certain monetary value attached to that concept. If India had been the colour of life, Hong Kong was the routine. It was an extremely clean, controlled, proper city where each building sort of morphed into the next with no real flavor of its own. I walked countless hours through many different neighbourhoods and at times, I had to check myself to see if a military step had developed. It simply had that air about it. Don’t get me wrong, I loved Hong Kong and I dove headfirst into the first bits of protein that I could get my hands on – a big sushi feed, but it was such a stark contrast from my previous 3 weeks of travel that my mind had difficulty with the adjustment. I rode the Star Ferry to City Central and hopped on a “Hop On, Hop Off” bus tour which took me through the Heritage Trail of Central City. It is a very busy, thriving metropolis. I wondered if there were any quiet streets anywhere in Hong Kong. The food of Hong Kong was definitely a highlight and ranged from the sublime to the exotic, from the fancy restaurant to the street vendor. People seemed to be eating everywhere and the variety was incredible. I honed in on the sushi, and there were no shortage of restaurants, serving fresh, beautifully presented meals. All three sushi feeds that I had were outstanding and reasonable (6 to 8 Canadian dollars). If the food was one highlight, the shopping had to be the second. The Harbour Mall seemingly went on for miles. After 3 days there, I think that there were still wings of it left untouched. All the big names, Chanel, Vuitton, Boss, had their presence but it was the smaller boutique style stores that piqued my interest. I ended up in Bauhaus, trying on jeans – everything seemed to fit, and walked away from that store with two pair under my arms. The Ladies Night Market was cool as well; Row upon row of shoes and leather goods, silks and cottons, and not only for ladies. Definitely worth a visit. Since I was half-heartedly looking for a camera and the camera stores numbered in the hundreds, I decided to pay a visit to the Hong Kong Tourism board and ask for their recommended shops. The lady at the Tourist office took pleasure in telling me that Hong Kong is a free market and none of the stores are actually regulated, however the Tourist Board does approve shops and I should only shop at those shops. If there is a price on the camera in the store, chances are that it is a legitimate store. If not, well, nothing can be guaranteed. It is buyer beware. Considering earlier in the day, I had been shown the camera that I wanted for $475 and now, at an approved shop, it was $875, I was thankful that I had NOT bought on impulse, for a change. Hopefully, that lesson will spill over into life at home. This entry was posted in Travel and tagged Hong Kong, kerryo12, Ladies Night Market. Bookmark the permalink.